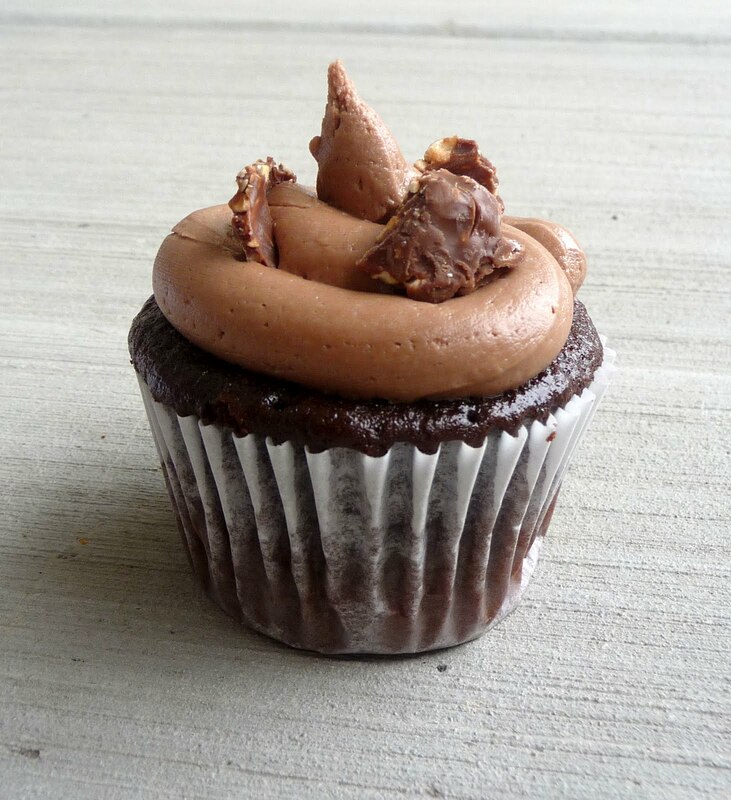 I am a HUGE fan of Nutella!And today I was craving it…one of the many perks of being pregnant :)I was looking for something new and decided to make cupcakes! and let me tell you…they were DELICIOUS! here is the recipe:NUTELLA CUPCAKE RECIPEMy FAVORITE Chocolate Cake:2 cups white sugar1-3/4 cup flour3/4 cup unsweetened cocoa powder1-1/2 tsp baking powder1-1/2 tsp baking soda1 tsp salt2 eggs1 cup milk1/2 cup vegetable oil2 tsp vanilla extract1 cup boiling waterPreheat oven to 350 FIn a large bowl, stir together sugar, flour, cocoa, baking powder, baking soda, and salt. Add eggs, milk, oil, and vanilla and mix for 2 minutes on medium speed of mixer. Stir in boiling water last. Batter WILL BE thin. Pour into cupcake tins and cook at 350 F for 17-20 minutes until cake is tested done. Cool in cupcake pan for 10 minutes, then take out and cool completely.While cupcakes are cooling prepare frosting.FROSTING:2 sticks butter, softened1 (13 oz) jar of Nutella1 pound powdered sugarpinch of salt1 tsp vanilla extract 6-8 Tbsp heavy cream or milkIn a large bowl, cream softened butter and Nutella until well combined. Slowly add powdered sugar, and continue creaming until well blended.Add salt, vanilla and 3 Tbsp heavy cream or milk. Blend on low speed until moistened. Add an additional 3-5 Tbsp of heavy cream or milk until frosting reaches desired consistency. Beat at high speed until frosting is smooth and fluffy.Frost cupcakes and top with crushed hazelnut candy bar.Enjoy!this recipe is liked up to:these fun link partiescheck them out!click on the link and check them out to see fun posts from others! Oh my Mum would drool over these. She loves nutella. They do look yummy!I enjoyed my visit to your lovely blog. I hope you'll stop by Katherines Corner and leave a comment, and maybe even enter the latest giveaway. Hugs! Ummm,yummy! I'm going to save this one. 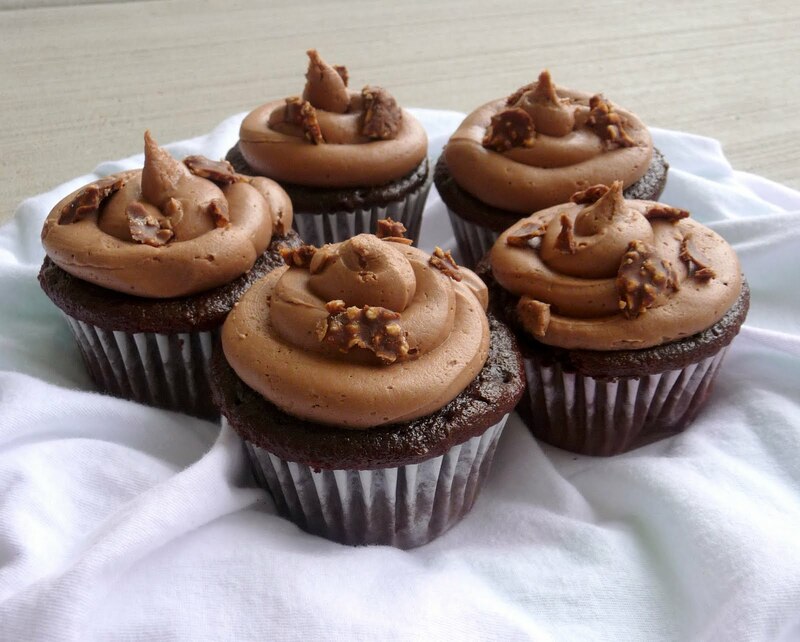 Nutella is one of my favorite sweets and this recipe looks amazing. yum! these look delicious, technology needs to improve quick so i can taste these through my laptop! thanks for checking out my blog too! You had me at Nutella. YUMMMMMM!!!! They look so delish!Thanks for sharing.Found you from Sew Can Do.Would love if you would link up with us at http://www.nothingbutcountry.com on our 1st link up party too. Love your ideas. I follow you back!! Good luck with your new baby! Can't wait to see pictures!! These look lovely! I love nutella! yum! I featured you today on my blog! Come grab a button! Oh my heavens these look amazing! I recently just discovered Nutella. Sad right! Gosh I have been missing out for so long! I can't wait to make these. I love Nutella too! I've never baked with it, but your cupcakes sound wonderful. These are so pretty. I attempted to cook a Nutella Swirl Pound Cake but it was a flop. The Nutella was too heavy to swirl like it was supposed to. But, I think using it in the frosting instead is the answer. I would love to invite you to share your recipe on A Well-Seasoned Life's Sweet Indulgences Sunday. Saw these on A Well Seasoned Life - they look yummy. I love baking with nutella. These look absolutely delicious! I love Nutella! I could just eat it straight out of the jar with a spoon. Mmmm. Thanks for following me! I'm following you now too. This is another recipe that I have to make. I love chocolate and nutella! My girls will be excited about this. Wowser, every recipe I see is SO awesome! Your husband must love all these treats and feel so pampered! Just made this recipe and it is delicious!! Do you own a bakery? Those cupcakes look devine! I see the cake recipe calls for 1-3/4 CUP Flour. Does that mean it's 1 plus a 3/4 cup flour? I made these tonight. They are fabulous! Thank you. Should I refrigerate them (because of the heavy cream in frosting)? Hello Katherine, please excuse my ignorance, how much is a stick of butter?